When Europeans first came to New Hampshire, moose were found statewide with the highest densities in the north. They were used as a primary source of both food and clothing and this unrestricted use quickly reduced their numbers and by the mid-1800’s moose were virtually extirpated from the state. The formation of the Fish and Game Department allowed moose to be protected from unrestricted hunting starting in 1901. During this time, habitat changes were occurring that were beneficial to moose. The transition of sheep pastures back into woodlands was one essential change for good moose habitat. In addition, in the 1960’s, a severe spruce budworm outbreak in the northern forest created the need for large timber salvage operations. These two habitat changes provided moose with the perfect mix of young and mature forest, essential to the well-being of moose. This new habitat coupled with protection allowed moose to make a strong comeback and by 1980, moose were once again found statewide. As moose numbers continued to grow, a moose management plan was developed by the department. This plan broke the state into six moose management regions which were typified by differences in moose and human population density, habitat, forest cutting regimes and climate. Each region has different moose density goals and these goals are set with the help of the general public every ten years. The most recent goals were set in 2015. They can be seen at the following link along with regional moose population changes: http://www.wildlife.state.nh.us/wildlife/moose/documents/moose-faqs.pdf. Currently, moose densities range from approximately 2.16 moose/mi2 in the most northerly region down to 0.10/mi2 in the Southeast region. North American moose densities, on average, range from 0.13 to 2.6/mi2. As our moose herd was increasing, our winters were getting shorter. Today, winter in most portions of the state is 3 weeks shorter than it was 30 years ago. Shorter winters are allowing parasites to thrive that were formerly killed by longer periods of winter weather. The winter tick is one of these parasites and it is responsible for increasing moose mortality and reducing the ability of adult cows to produce calves. In the early 1990’s the department recognized that moose were no longer thriving in the north-country and in 2001 partnered with UNH professor Dr. Peter Pekins, to implement moose research that would help us understand what was happening. Collaring took place in 2001 – 2003 and again in 2014 through 2017. As information began rolling in, Maine and Vermont also began collaring moose and the three states are working together to find out how moose density, changing weather patterns and cutting practices are influencing this parasite in New England. To date we have learned that ticks are the primary mortality source for moose in northern NH. They are also the cause of reduced calf production. Tick numbers are most influenced by winter length and moose density and as moose density declines, ticks and their effect also decline. Current and future research will focus on how more frequent short winters will influence tick numbers and subsequent moose health, and how lower moose densities in the face of shorter winters, will impact tick numbers. To learn more about this research, and how ticks and climate change are influencing our moose, go to http://www.wildlife.state.nh.us/wildlife/moose-study.html. As a final note, many people want to know what can be done to help moose survive a changing climate which brings increasing parasite loads. The most important thing to remember is that moose are a northern species. They evolved in ways that allow them to live in cold climates, climates that normally kill ticks. As our weather changes and our winters continue to shorten, there is a whole host of parasites and diseases normally associated with southern climates that will be able to survive here. Our changing climate is fundamentally changing the environment’s ability to support many of our northern species, be they flora or fauna. If we want our northern species to remain here we must act now to halt and reverse the impacts of climate change. 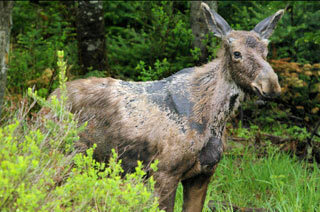 For more information on why chemical intervention is not a remedy please visit http://www.wildlife.state.nh.us/wildlife/moose/index.html.